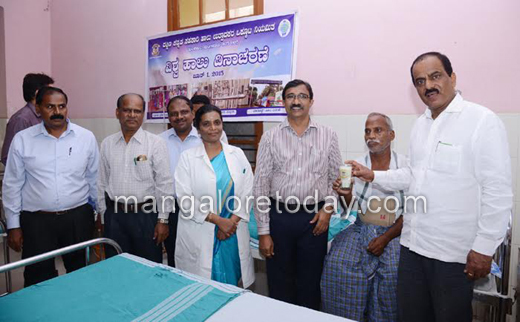 Mangaluru, June 2, 2015 : Milk and fruits were distributed to patients at Government Wenlock Hospital and to children of an Anganavadi at Jeppu on behalf of Dakshina Kannada Co-operative Milk Union Ltd on the occasion of World Milk Day on June 1, Monday. 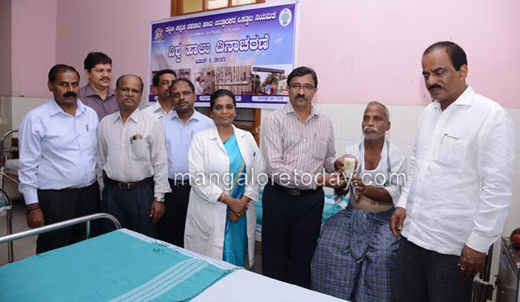 President of the Union Raviraj Hegde along with other officers visited the Hospital and Anganavadi to distribute milk and fruits. Later in the day, MP Nalin Kumar Kateel inaugurated an Agro-waste based boiler at Kulshekhar dairy. A function held in this connection at the office of the Union was attended by several dignitaries including MN Rajendra Kumar, Chairman of SCDCC Bank. Speaking on the occasion, he said the Bank was thinking of providing debit cards to members of Milk Co-operative Societies who are account holders with the Bank. Outstanding milk dealers, drivers and other staff of the Union were honoured at the function.